Solid names like these three companies have plenty of future potential despite their strong long-term past returns. There's always a temptation to sell stocks that have done well, especially after a long market run that seems too good to last much longer. Yet the best investors have historically refused to give in to the pressure to sell, instead recognizing the long-term potential that top stocks have to produce amazing returns over time. Below, we'll take a closer look at Bank of America (NYSE:BAC), IPG Photonics (NASDAQ:IPGP), and Disney (NYSE:DIS) to show why we're refusing to sell them despite their impressive long-term performance. Sean Williams (Bank of America): After holding on to my shares for more than five years, I don't see any reason that I'll be parting ways with my Bank of America (NYSE:BAC) stock anytime soon. Though I've seen a number of Wall Street pundits suggest that Bank of America's recent run higher may be a stretch, there are viable reasons to believe it's going to march to $30, if not higher. The biggest catalyst for Bank of America is rising interest rates. Of all the major money center banks, none will benefit more from monetary tightening and higher interest rates than Bank of America. Based on the company's most recent 10-Q, a 100-basis-point increase in both short-term and long-term interest rates would lead to an additional $5.3 billion in net interest income. Since the election, we've witnessed a huge surge in Treasury yields, and the Federal Reserve has hiked its federal funds target rate by 25 basis points. With the Fed forecast to hike rates by 25 basis points three separate times in 2017, Bank of America could be fully recognizing this forecast $5.3 billion in added interest income by 2018. On the other side of the equation, Bank of America has been steadily cutting costs. According to Forbes, Bank of America has closed more than 400 of its branches over the past two years. Doing so both reduces its overhead costs and aligns the bank with millennials and Generation Z, who prefer the convenience of mobile banking. Combining these cost-cuts with B of A's added interest income could boost its annual EPS by around $0.50 in 2018, based on my best estimate, as well as give the bank ample cash to increase its dividend. Let's also not forget that incoming president Donald Trump has campaigned for less business regulation, which could mean deregulating the banking industry. This would imply lower costs and improved margins for Bank of America. Long story short, things are finally looking great for Bank of America, with its Great Recession-based mortgage issues clearly in the rearview mirror. This is not the time to sell this top stock -- I know I won't. 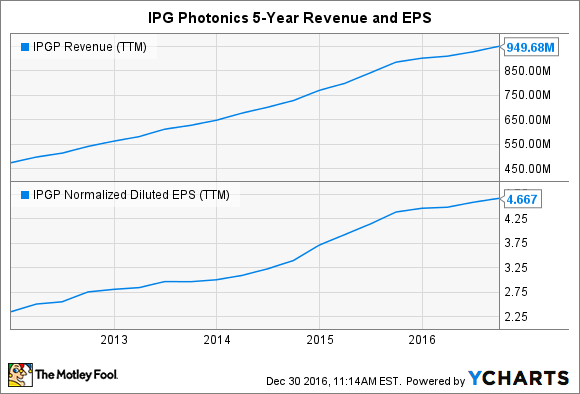 Brian Feroldi (IPG Photonics): Worldwide economic growth has been anemic for years, but that hasn't stopped IPG Photonics from putting up impressive growth numbers. As a leading provider of industrial fiber lasers, IPG has benefited from the dual trends of increased laser adoption by manufacturers and from fiber lasers taking market share away from traditional CO2 laser systems. Those trends have combined to push IPG's revenue and EPS to new heights. IPGP Revenue (TTM) data by YCharts. It is not hard to understand why more companies are switching to fiber lasers. They provide a higher beam quality, are easily scalable, take up less space, and have a lower total cost of ownership. Those factors have helped IPG take market share in applications like cutting, welding, materials processing, and more. Looking ahead, I think that investors can continue to expect plenty more from IPG. The laser market in general is growing at about 6% annually, and fiber lasers only represent about 31% of total sales. That gives the company plenty of room to increase its market share over time. Thus, even though IPG is currently trading near its all-time high, this is one stock I can't see myself ever selling. Dan Caplinger (Disney): Shares of Disney struggled in 2016, finishing essentially flat compared to a strong double-digit positive return for the Dow Jones Industrials. The primary reason that most of those following the stock cited for the sluggish performance was the media giant's challenges with its television properties, especially ESPN. Although the sports network continues to dominate cable television, trends toward cutting the cord in favor of getting content digitally through internet streaming pose a long-term threat to cable's biggest players generally. Moreover, rising prices for high-quality sports content and a glut of coverage across the cable spectrum could also weigh down profits in the long run. Nevertheless, I refuse to sell my Disney positions, largely because of the huge promise in the company's other areas. The company's entertainment studio remains a colossus in the industry, and its ability to churn out nearly guaranteed winners in popular established franchises ensures a steady stream of cash flow for investors for the foreseeable future. Moreover, even in the television segment, Disney has endured shifts in distribution before, and key partnerships with players in the streaming industry could keep it on top of its competitors. With so much potential for future moves to cement its leadership, Disney is a strong long-term holding for investors of all ages.